Chill Co designs corporate mindfulness programs specific to your company’s needs and challenges. In addition to your specific goals, you can count on improved employee productivity, collaboration, creativity, emotional intelligence, and less stress. You can choose from several programming options. Regardless of your team’s experience, we’ll meet you at their comfort level. Our instructors are experts at navigating sessions with meditation newbies, zen experts, and everyone in between. And we’ll always include practical, easy-to-implement tactics your team can master right away. 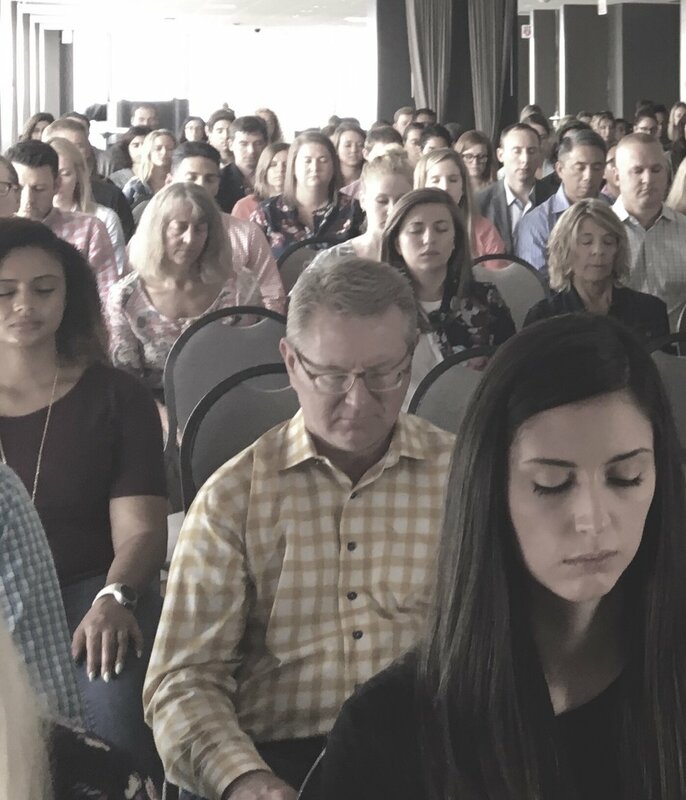 Our "Introduction to Mindfulness" course has been shared at over 200 Chicago companies. We'll customize a series of classes to address relevant themes in your industry, such as creativity, negotiation, and stress control. From three hours to a full day, we'll make the most of having your team together in one room, addressing themes like building emotional intelligence to enhancing communication. We'll not only offer you a special monthly membership rate for your employees, but will also help you promote internally. Establish studio credits for employees to draw upon for meditation classes and massage services. With the help of a law firm, we designed this course to fulfill the mental health and substance abuse CLE requirement. Discover the benefits of meditation, how and why it works, and the basic tenets of the practice. Discover the benefits of mindfulness and mindfulness-based stress reduction. Your breath, body, emotions, and thoughts are the focus of this series. Explore the concept of conscious leadership, encompassing self-awareness, self-regulation, motivation, empathy, and social skills. Learn specific practices to enhance your emotional IQ. Active listening is emphasized as a cornerstone of teamwork, utilizing specific listening / kindness meditation techniques. Creative thinking requires uninterrupted time to focus. Learn techniques to eliminate both external and internal distractions. Slowing down allows us to speed up and be more effective in our roles. Intention-setting is an important mindfulness practice to helps us stay focused and productive. Learn tangible mindfulness skills to infuse throughout your typical workday to encourage teamwork and improve workplace satisfaction. Our bodies and minds are intrinsically linked. Experience how gentle yoga poses can help settle the mind and perfectly complement guided meditation. The physical benefits of meditation include lowering blood pressure, reducing blood sugar, and increasing gray brain matter. In this session, we discuss contemporary research studies that support the medical benefits of meditation. Understand the physical and mental impact of stress and learn visualization meditations to reduce stress response.